It's 11:30 pm and in this slightly dark and judiciously cropped tree selfie, Christmas at our house looks postcard-perfect. But in reality there are boxes and bills and blankets and coats and wet shoes and easily 20 bottles of meds and folding tables and stuff to clean up sick-cat barf and plates of half-eaten cookies and basically something that needs time and attention on every counter, table and square foot of floor space in sight. It's exhausting and defeating just to look at. And none of us is sure how it got this bad. But in the big picture, it's small stuff. And it really doesn't matter. I moved home two years ago in part to take care of my dad. And I'm thrilled to do it. I drove him to two doctor appointments today and helped get him changed for an X-ray and we drove to the hardware store to get him a rubber tip for his cane and we had lunch and got some Christmas stuff and took our kitty -- who is actually pretty sick -- to the vet, where he proudly told the doctor that HIS dad had been a vet, and it was an honor and a joy that I'm here to take care of him. And tomorrow we start all over again with two more doctor appointments and more Christmas shopping and probably lunch and I'm going to remember and savor every moment of it because when he's no longer here I can look back and say "I took care of my dad. And we had lunch. And we laughed at dumb stuff. And he told me stories about my relatives and what cool old buildings used to stand where in the city and where he and Mom lived before I was born and which of his friends who've died he really misses and how he hates to be blind and I took care of my dad." And that street runs two ways. I've been on a two-year emotional roller coaster of bipolar highs and debilitating lows and lengthy hospitalizations and miserable, crushing side effects of taking and withdrawing from maybe 30 psychotropics (which, all things considered, I still think is a really cool word) and quite literally sleeping my life away as we try to find a med combination that doesn't make me unstable and embarrassingly fidgety and relentlessly, overwhelmingly drowsy. And my mom and dad have been my super-advocates all along, organizing my ever-EVER-changing meds, making up a bed for me on the couch on the days I can barely crawl home from work, making sure my insurance is up to date and I'm not missing a dizzying array of doctor appointments with a dizzying array of doctors and making me pot roast and Jell-O with fruit in it and in general just being awesome. But we're not special; millions of families are facing millions of medical problems, some easier than ours and some crushingly harder. And millions of families also have messy houses, especially around the holidays. And there's a glaringly obvious metaphor in there that can be interpreted in positive or negative ways. For me, it's all good. We'll get the house picked up and back in order soon. My mom will eventually forgive me for announcing to all of Facebook that we live in pestilence and squalor. I'll get my meds -- and my brain -- straightened out. Mom and Dad will or won't get sicker or better and I'll be right here to take care of them. 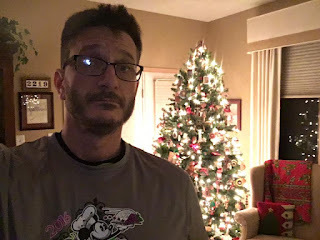 And my slightly dark and judiciously cropped tree selfie might not show our struggles and messes, but it totally captures all the warmth and joy and love and -- I'm sorry -- really ugly ornaments in this house, in this family, in this world of uncertainty and unfairness and hope and fierce, unbreakable devotion. Follies: Oh aren't I proud to be? Blackouts and ERs and Cops, 2.0 My! Blackouts and ERs and Cops, 1.0 My!